The kitchen is one of the most utilized rooms in the home. From cooking to gathering, many people spend a majority of their time at home in the kitchen. 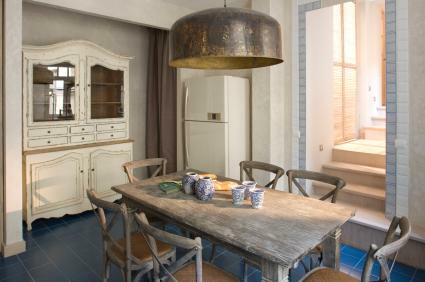 Create a warm and inviting atmosphere in your kitchen by adding some country style. Whether you want a full country kitchen, or you just want to add some country style accessories, this charming and homey design will have you feeling right at home. What Is Country Style Design? Country design is actually a catch-all term for a wide range of design styles, from Country French design to English Country design to American Country style design (sometimes called American Rustic design or Rustic design). While these styles vary a great deal when you look at the finished product, the fundamentals of these styles and the ideas behind them are the same. Country style is all about incorporating the natural elements and the history of a location into the design. Country style is also about the comfort found in the familiar. It can be basic and no frills, but definitely a lot of fun. If there is one style where knick knack lovers can go all out, country design is it, making it perfect for the kitchen. 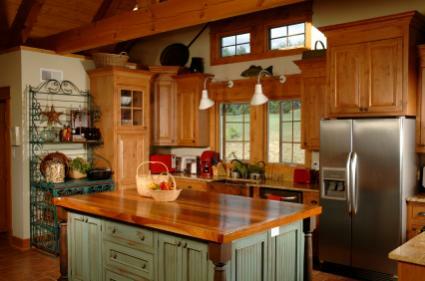 There are many ways you can incorporate country design into your kitchen. Whether you play up your home's architectural features, revamp your current cabinets and counters or simply accessorize your existing space, Country design is extremely versatile and forgiving in the kitchen area. Check out the architectural features of your room. If you live in an older home, you may have some areas you can play up, like rough hewn beams in the ceiling or a stone fireplace/chimney. Country style is about a rustic, somewhat "old-fashioned" look, so if you have some period detailing in your room, make it a focal point. This may mean hanging pots and pans above a brick or stone fireplace, staining wood beams to bring them into better contrast with the ceiling color or refinishing some old oak floors to bring out their character. Look for copper bottomed pans, cast iron skillets, and copper or distressed brass utensils and display them. 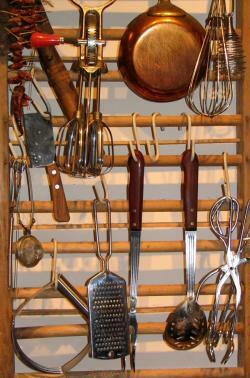 Keep the utensils in a jar on the counter and hang the pans from a suspended rack. Family hand-me-down pots and pans are perfect, or if you don't have those, look for new ones that look like they could have been your grandmother's. An attractive look in Country kitchens is the use of bead board or wainscoting on the bottom half of the wall with a contrasting wallpaper or color painted above. If bead board isn't for you, consider breaking up the walls with crown molding or a chair rail. Also consider a plate rack on one wall to showcase some favorite pieces. Those with a Country themed kitchen aren't afraid to use patterns. Curtains, tablecloths and chair coverings use plaids, florals, dots and farm animal patterns for color and interest. If colors other than blues or whites are used, you'll find them in the textile or wallpaper patterns. 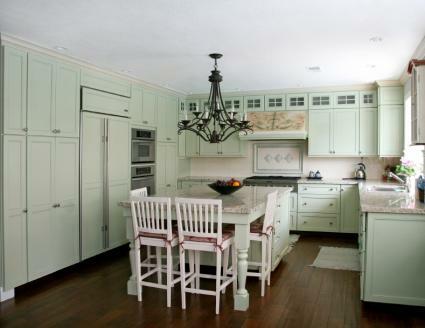 Give your kitchen cabinets a makeover to fit in the rest of the Country design by painting them. Select a light color such as cream, white, light blue or gray and distress the edges slightly to give them a worn look by sanding them. Replace your cabinet hardware to match by using porcelain, hand painted or antique knobs and pulls. If you don't want to commit yourself to painting all the cabinets in the room, consider doing only the island and leaving the rest of the cabinets in their natural wood tone. The contrast of the antique island can bring some warmth and depth to the room, without overwhelming the space. Country kitchen design is all about creating a family-friendly, welcoming environment, and ideally, a country kitchen should have an eat-in area. A dark wooden table with high backed wooden chairs with wicker seats is perfect; add seat cushions in prints to add a splash of color. An island topped with butcher block looks great in the center or the room, and can also offer additional seating. Pick up stools that can be painted in colors to match the accents in the room and top the seats with patterned cushions. With the exception of the tiles, look for matte surfaces for the counter that will absorb, rather than reflect light. This lets the counter blend seamlessly into the kitchen, without overpowering it. The ultimate country kitchen will be overflowing with charming little additions to bring the room together. There are no hard and fast rules here; look for accessories that mean something to you and your family. Display old family cookbooks and old family photos. Comb the antique shops and flea markets to look for Colonial pieces to complement your décor. Your kitchen will continue to evolve, and that will only add to the charm. If you're looking to decorate your kitchen with some of the ideas in this article, try one of these online retailers. Sticks and Stitches offers a large selection of country kitchen decorations. You won't find furniture here, but if you're looking for small items to finish the look, this a good place to start. Alice's Home and Cottage offers a selection of linens, decorative items, towels and accessories. Try HensTooth.com for an interesting selection of kitchen items. Through the Country Door offers a nice selection of furniture pieces and decor for a rustic kitchen. There are regional variations on American country style, of course, so your country kitchen design in Mississippi may be completely different than your friend's country kitchen in Maine. This is only natural, given the different histories and environments of the areas; that is the beauty of country kitchen design. 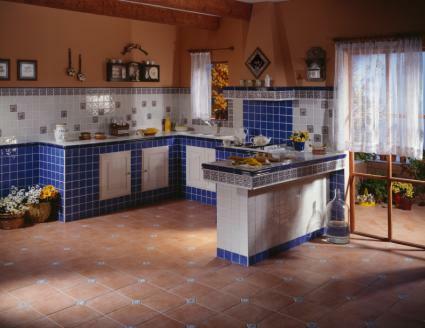 Bring in the pieces of your own heritage to make your kitchen a true expression of you.